And how you can use drip messaging to increase conversions and decrease churns. Free trials are a common and effective way to introduce your product to new audiences. But too many business owners make the mistake of assuming that a free trial user will eagerly go through the onboarding process (a.k.a. first-time-user experience or FTUE) on their own — immediately after signing up. Many users will not because they don't have the time or need to do so at the moment. Instead, they make a mental note to return to your site later. But many never do. Either your site dissuaded them, they got busy and forgot, or they never understood what the point of your product was in the first place. They signed up for a free trial because, well, why not? Just because someone isn't eager to follow through with your onboarding process doesn't mean they're not a prospect worth pursuing. And it doesn't mean you have to invest a lot of resources to turn their indifference into loyalty. In fact, for many people all they need is a simple reminder. That’s why every SaaS product needs a well-designed automated drip email campaign (automatic emails sent on a schedule) that triggers when users sign up. And the best part is they do it automatically. The mistake here is acting like the user is already sold on using the product and just needs to know how to use it. The reality is they still need to be convinced your product is worth their time and effort. Approach your drip emails like you do your ads: Remind users of the value props they sought to fulfill with your product. They will need the reminder. Tease them with specific features they’ll care most about. Unlike ads, however, the goal of drip emails is to get users to become confident power users. Confidence comes about through education. The trick is educating your users based on what they view as the most enticing value props and features of your product. The most effective drip campaigns use both of these factors to customize the sell to each user. Your onboarding survey doesn't need to be long or complicated. It should not be. 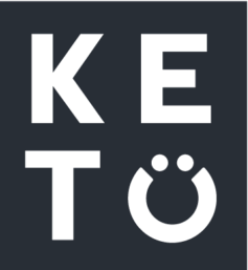 Surveying new users can be as simple as adding a question or two in your sign up form/process that lets you most meaningfully segment the user’s interest in your product. Then, in your drip emails, you tease the features and knowledge base content that’s most relevant to that interest. For example, here's the free-trial process for a Quickbooks analytics software company. After asking our first name, the company then asks us our business intelligence goals. Using a survey during the onboarding process. This information can be used by the company to tailor their drip emails. If we chose "consolidate multiple company files," for example, it would make sense to kick off our drip campaign walking our user through the steps to make that happen. You can nudge users to “Carefully select the best-fitting option” so that “You can save them time by providing the most relevant in-product resources.” Even if that’s not true, tell them that so they don’t randomly select an answer. This information is also extremely valuable to have for tracking per-segment long-term behavior in your app. If you know which use cases lead to the highest LTV, you can prioritize your ad audience targeting toward these segments. 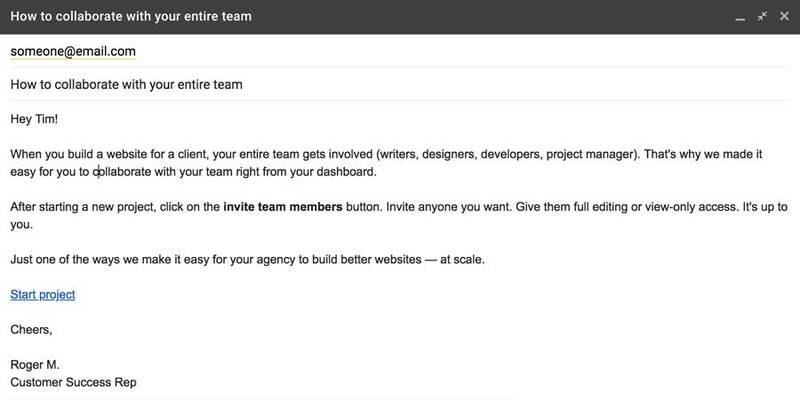 Agencies are sold on the benefits of team and client collaboration features. Freelancers are sold on the benefits of quicker site turnaround times and automated client billing. Businesses are sold on the advantage of no longer needing engineers to build their content-rich corporate pages. 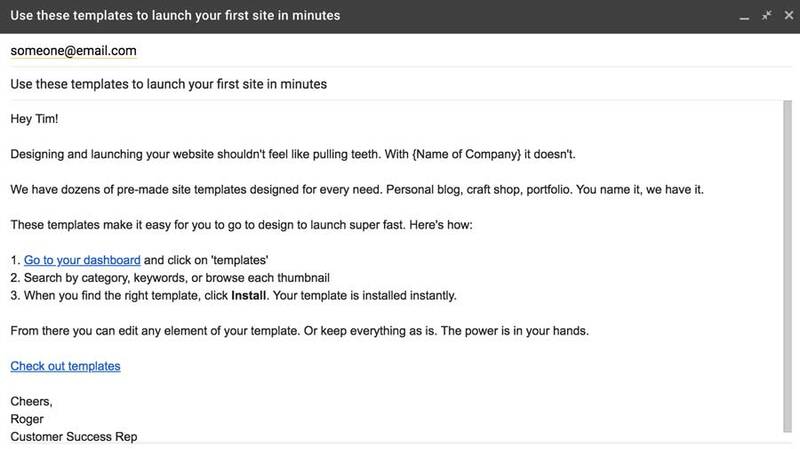 Individuals are sold on the benefits of getting started quickly with pre-made site templates. An email tailored to agencies. An email tailored to individuals. Imagine if you mixed this up by selling individuals on the agency benefits. That’s basically how all drip emails are currently written: they attempt to target everyone, and conversion and customer satisfaction suffers as a result. Onboarding surveys are an effective way to customize your drip messages from the start. But you can also customize your messages based on specific user actions and behaviors within your app. For example, you can trigger an email to new users once they create their first website — or when they add a team member to their account. The goal here is to help users take logical next-steps to get more familiar with your product and integrate it into their life or work. A triggered email following specific customer actions. Services like Intercom allow you to create different types of messaging (in-app, email, text). In-app messages can be useful in keeping users engaged while inside your dashboard. For example, if you sell an email-service provider, after a new user uploads their contacts you can trigger an in-app message encouraging them to now design their first email. Or you can trigger messages based on inaction — like if new users haven't logged into their dashboard 48 hours after signing up. The goal here is to remind them of the value you bring to their lives. 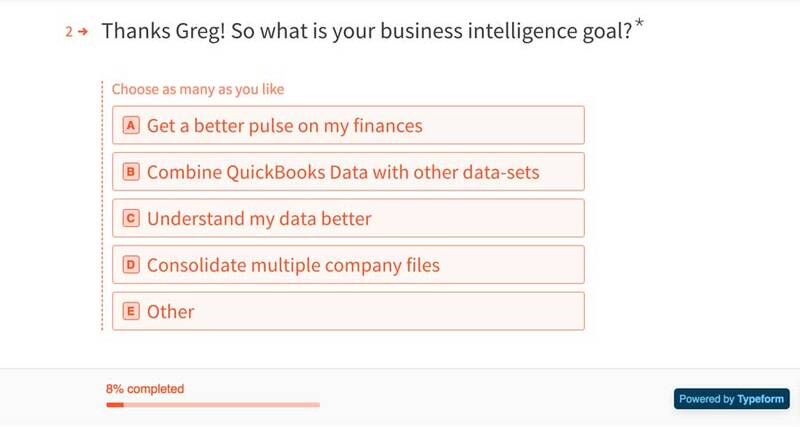 Your initial survey will help you tailor this messaging to each user. 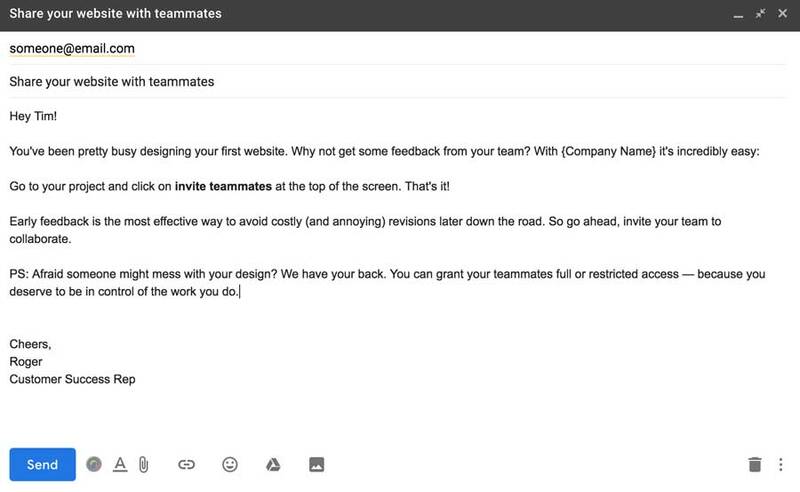 And, of course, you'll want to send emails to users as their free trial ends. Customizing these messages using both the initial survey and user behavior will help you convey the relevancy of your product. Another mistake we see companies make is sending too many messages to new users. Here's how to avoid that. First, create a spreadsheet in your program of choice. We recommend Google Sheets. Create separate tabs for each of your segmented users if applicable (this goes back to that onboarding survey). Build your list around your segmented users, as seen here. In the first column list out the critical events required for new users to become power users. Keep in mind this may not be the same for every type of user. Using our example above, an individual user might require different steps than an agency — or at least different messaging. Only focus on vital events. The fewer events you list here, the fewer messages you'll need to send your new user. In the second column, determine how/when your messages will be triggered. For example, after four days? After a specific action or inaction? You may want to have multiple time-based triggers for each key event—for example 3 days, 7 days, and 21 days after someone signs up. Decide the most effective messaging type to use for each of these events. For example, does it make sense to have a welcome message to new users inside your app or via email? We suggest email — that way users receive it even if they don't go to your dashboard. This spreadsheet gives you the visual overview needed to know what your free trial users will experience. That way you can add or subtract messaging as needed. As an SaaS, you’re bound to have countless people sign up for a free trial of your product but never take the next step (use your product). Many companies shortchange their campaigns. Drip emails can be complex and time-consuming to execute. But the tips above should help your company use your existing resources create an optimized drip campaign that helps you decrease churn and increase conversions.